As Director of the Lausanne Global Classroom, Brent went to Oxford, England in September for a meeting with the team that ensures the consistency and excellence of all the Lausanne Movement’s content, such as books and articles that are published, the global gatherings that are held, and of course, the Global Classroom. Oxford was the home of C.S. Lewis, J.R.R. Tolkien, and Winston Churchill, three very influential figures in the 20th century. We had enough frequent flyer miles for Kim to go too. It was a great trip! Oxford is home to the top university in the world, and is also full of history. On a walking tour of the city, we were quieted and humbled by the historical marker on the street indicating where men were martyred for their faith during the Reformation. The cross shows where men were martyred for their faith. One other incredibly serendipitous moment took place as we walked the streets of this ancient city. 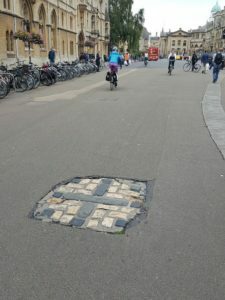 Since Oxford is so full of history and so famous, it is often used as a set for movies. Such was the case on the day we were there. 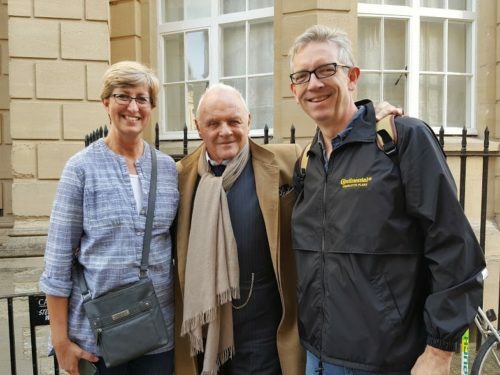 Walking along, we came upon a movie set and who should we see but Anthony Hopkins! He was so kind and even invited us to have a picture taken with him. Mr. Hopkins had starred in a movie about C.S. Lewis twenty-three years ago called “Shadowlands”. One of our friends remarked that it was as if we had met C.S. Lewis himself! We will never forget it! It is truly a joy to serve the Lord around the world through CIT, the Lausanne Movement, and OMS. We continue to need your prayers and support for our family and ministries. Thanks for being a partner!